There's nothing like fresh, juicy berries in the summer. While typically relegated to desserts and sweet treats, this unusual main-course salad recipe uses blueberries, balsamic vinegar and shallots to create a tangy relish that's just a little bit sweet. 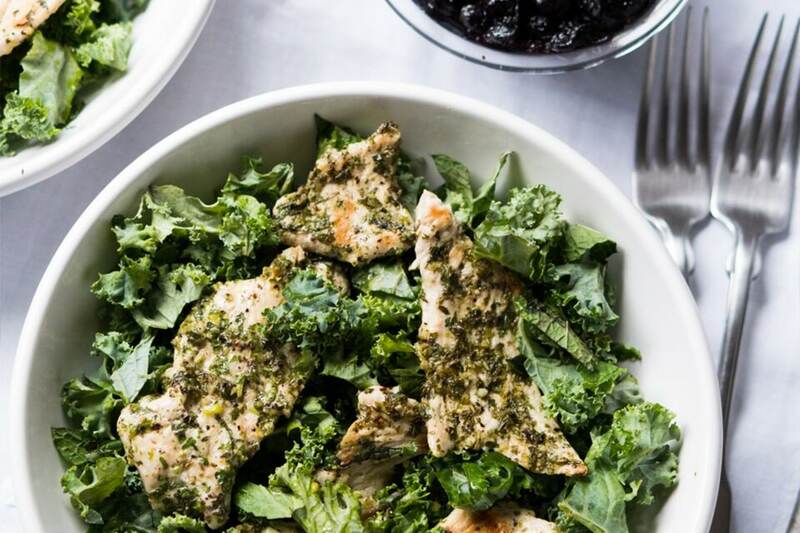 Combined with flavorful herb-marinated chicken, baby kale and creamy avocado, it makes for an easy summertime lunch or dinner. Marinate the chicken ahead of time so it has plenty of time to soak up the fresh herb marinade. Use leftover berry balsamic relish on sandwiches or with grilled salmon or tuna. If you'd like to serve this delicious dish as a side salad instead of a main course, you can easily make it vegan. Forgo the chicken, add another avocado, and substitute agave nectar for the the honey in the berry balsamic relish. Per Serving: 966 calories; 44g fat; 104.0g carbohydrates; 49g protein; 102mg cholesterol; 367mg sodium. The berry relish is the star of this salad and is super tasty on its own with just some sliced baguette bread. 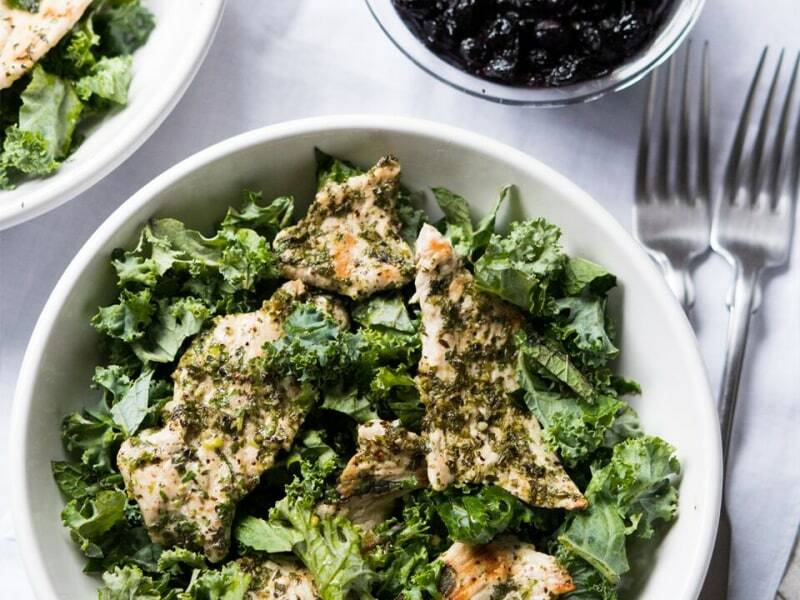 It's a bit thick for it to be a dressing, but it coated the chicken and kale very nicely. Blueberries plus balsamic vinegar with a hint of chile pepper has my head spinning from greatness! 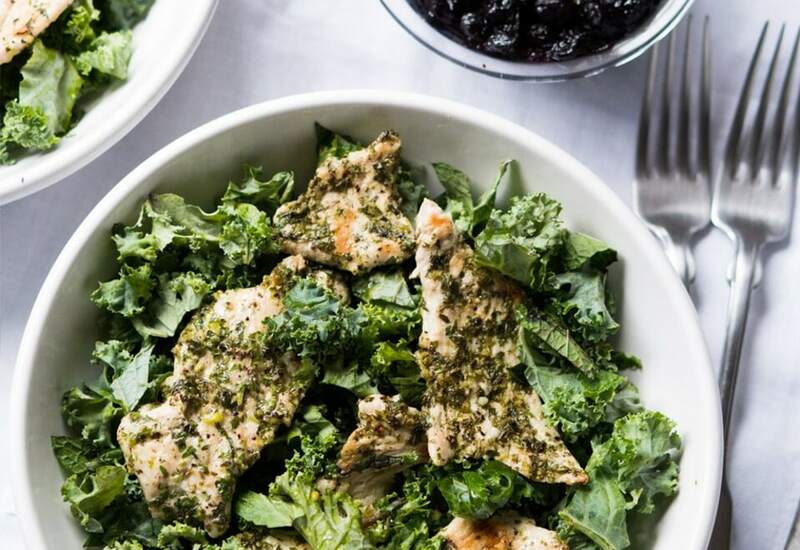 So good all on it's own, but then with the chicken and kale salad and some creamy avocado...heaven. The berry balsamic relish is to die for! I admit, I was a skeptic at first, but my husband convinced me to try it and now we're both hooked. It pairs wonderfully with the chicken! I made this salad with arugula instead of kale, and it was so good.